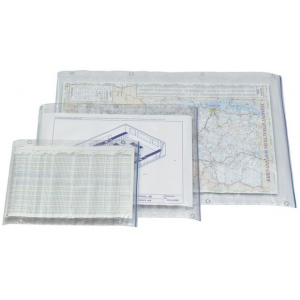 The .13 mil thick vinyl and waterproof zip top closure protects valuable documents from dirt dust and moisture. * Great for commercial or marine applications. * Notations can be made on the translucent vinyl covers by using a grease pencil or water-based felt pen and wipes clean with either a dry cloth or soap and water. * Perfect for business contractors architects pilots surveyors engineers builders navigators artists and more.